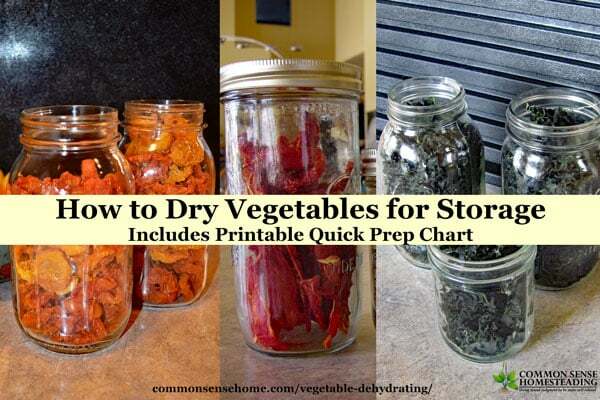 Vegetable dehydrating is an easy way to store vegetables for long term use. During harvest season, my dehydrators live on my kitchen counter. Herbs, greens, fruits, veggies – everything get dried and neatly tucked away for use year round. This post covers basic instructions for vegetable dehydrating to help you dry vegetables safely at home. 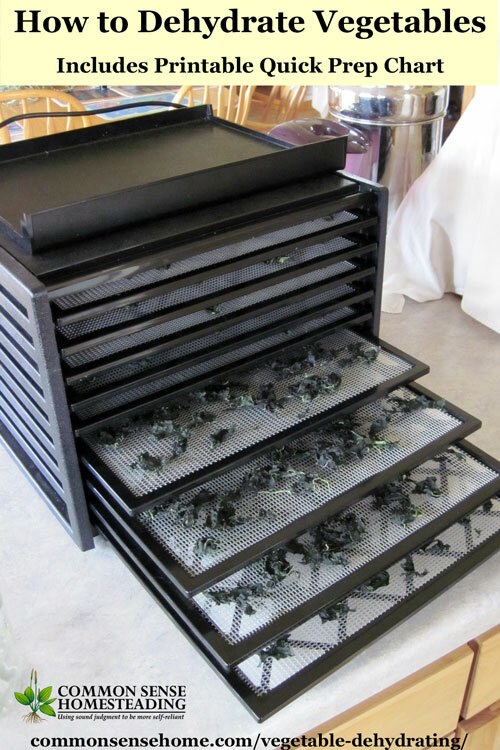 Vegetable Dehydrating – Why Dry Veggies for Food Storage? Space Saving – Because vegetables have so much water, they shrink dramatically during dehydrating. If you're tight on storage space, dehydrating is a great fit. No electricity required for storage – Once processed, dehydrated vegetables require no refrigeration or freezing. Lightweight – Since most of the water is gone, dried vegetables are lightweight, making them handy for camping or emergency preps. Minimal equipment required – I like commercial dehydration machines, especially in our humid climate, but folks also dry successfully with solar dehydrators or homemade drying racks. This non-electric 3 tray covered drying rack can be hung near a wood stove or other well-ventilated area for dehydrating. Note: If using solar or air drying, drying times will likely be longer than those specified below. Turn food daily, protect from bugs and maintain good air circulation until food tests dry. For guidelines on drying foods using an oven, see “Home Food Drying – 6 Things You Need to Know to Dehydrate Food at Home“. Solar Drying – The Sun Oven can be used as a food dehydrator as well as an oven. See a more extensive list of kitchen tools for dehydrating in the post “Home Food Drying – 6 Things You Need to Know to Dehydrate Food at Home“. For a full dehydrating course, please visit Traditional Cooking School. 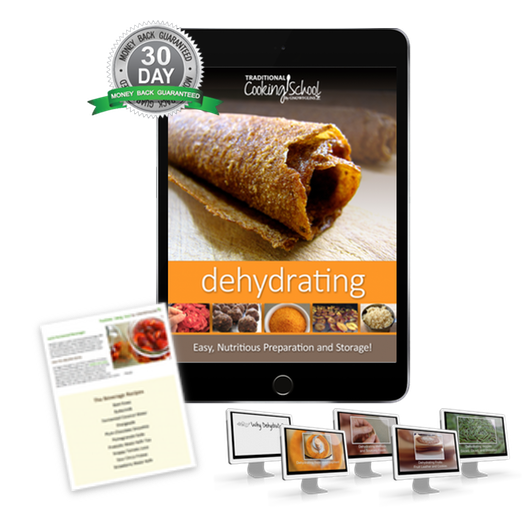 In this course you'll learn how to quickly and easily dehydrate your own traditional foods for long-term storage, summer-fresh flavors, good health and freedom from energy dependence whether you’re on the camping trail or in your own kitchen… The Dehydrating eBook & Video Package (retail $64 – sale $20) contains: the Dehydrating eBook, 5 Dehydrating Master Class Videos, Lacto-­Fermented Beverages eBooklet, and bonus printable worksheets! For dehydrating vegetables, set your electric dehydrator to 140°F (60°C). Remember, thinly sliced veggies will dry faster, and if you get all the pieces roughly the same size, they will dry in roughly the same amount of time. Most vegetables should undergo a pretreatment, such as blanching or dipping, before dehydrating. Why? They dry faster and last longer. If I'm going to spend weeks growing beautiful veggies, I can take a few more minutes to dry them correctly. Blanching is briefly precooking food in boiling water or steam. It stops enzymatic reactions within the foods, which slows down decomposition. Blanching shortens drying time (skins are softer so water gets out easier) and kills many spoilage organisms. Adapted from Virginia Cooperative Extension. Use a steamer or a deep pot with a tight-fitting lid that contains a wire basket or could fit a colander or sieve so steam can circulate around the vegetables. Add several inches of water to the steamer or pot and bring to a rolling boil. Loosely place vegetables into the basket, no more than 2 inches deep. Place basket into pot (vegetables should not make contact with water). Cover and steam until vegetables for the recommended time (Table 2). Remove basket or colander and place in cold water to stop cooking. Drain and place vegetables on drying tray. Use a blancher or a deep pot with a tight-fitting lid. Fill the pot two-thirds full with water, cover, and bring to a rolling boil. 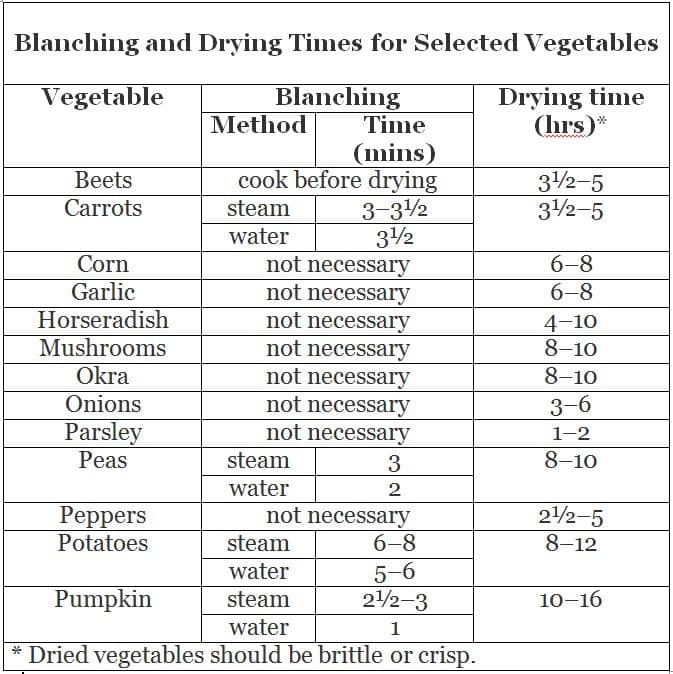 Place vegetables into a wire basket and submerge them into the boiling water for the recommended time (see table below). Remove vegetables and place in cold water to stop cooking. Note: Although not listed in the chart, I do blanch all cabbage family crops (broccoli, cabbage, cauliflower, kale, etc.) for 2 minutes in a boiling water bath. 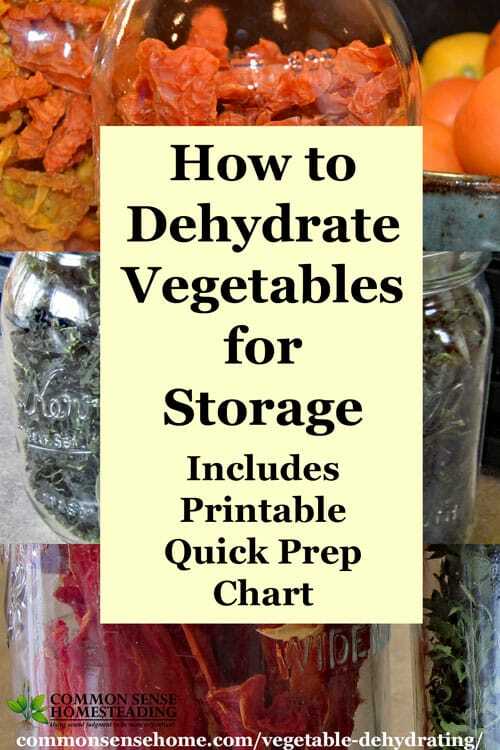 How do I Know my Vegetables are Done Dehydrating? Up to 90% or more of the moisture is removed from vegetables when they are fully dry. They should snap/break cleanly, and be brittle. This may take longer than listed times, depending on the humidity levels. Quick dryness check: Put your dehydrated vegetables in a mason jar, put a lid on and wait for a day. There should be no condensation on the underside of the lid. If you see condensation, put them back in the dehydrator. You might also want to cut any thicker chunks into smaller pieces. If you want to be extra sure, you can buy a hygrometer that fits on top of a mason jar like a lid, the Hygrolid. My preferred storage method for dehydrated vegetables is vacuum sealed in mason jars. You can also use plastic zipper bags for short term storage, or Mylar pouches with oxygen absorbers for longer storage. However you store your dehydrated vegetables, keep them away from moisture as much as possible. Dehydrator Versus Freeze Dryer – What’s the Difference? Originally posted in 2014,updated in 2017. I would first dry my garden herbs, then fall fruits..and then sprouted grains! I would probably play with it first…. go buy bananas and berries and make snacks. Then I may get serious and dry some things for my food pantry. I think the first I would really want to dehydrate would be strawberries and bananas! Would love another way to store what we grow. I would dehydrate our herbs, veggies and make jerky! I would dry tomatoes first and my husband would make jerky. ANYTHING I can get my hands on! If I win, I’ll be drying everything I can get my hands on!!! I would dehydrate herbs first then I would start on veggies and make fruit leather. Tomatoes!! Store-bought sun-dried tomatoes are so expensive. This is the most fabulous dehydrator I have seen. Would sure help make short work of harvest! I invested in one (same size, without the timer) a couple of year ago, and it has been great during harvest season when large amounts of produce start coming in. I load it up before bedtime and empty it in the morning. I would have to learn and play with the dehydrator because I have never had one!! This is absolutely awesome that you are offering this dehydrator!! I am new to your site and new to canning and dehydrating!!! I am absolutely excited about trying to eat healthy and preserve food. I am totally new to this but I am trying to include my husband and children (as much as they would like) in this process. It is expensive to try to buy everything at once though!! Thank you for the chance to win this dehydrator!! I would dehydrate mushrooms first…. have several winter soups recipes that assorted dried mushrooms would be perfect for… Last summer I dried plums and peaches for the first time and have been saving tips and “recipes” so I can start dehyrdating a bigger assortment of foods and the Excalibur Dehydrator will the perfect ticket! I would dehydrate whatever I have in the garden ready to process. I want to try some cucumber chips and see if they are good. The peaches are ready and would be good dehydrate as well as cantaloupe. I would LOVE to win this dehydrator!!!!!! My first drying project would be tomatoes. YUM!!!! Dried tomatoes would be a must as would jerky from all types of meats and seafoods. I also dry ingredients for ethnic cuisines; asian, mexican, middle eastern etc. Another must would be herbage!! I would definitely put it to good use. Tomatoes, onions and cilantro.. Would also like to try jerky. I would dehydrate my turnip, mustard and kale greens! Then I would go after my elderberries, mulberries and then my all of my herbs too! I really need this one that can handle such a variety of items and thank you for the opportunity. I have about 20 herbs on my property and I hand dry them in small batches in the attic now. What a joy to have an Exclaibur! I’d start off with PEACHES! Oh my, I would absolutely love this dehydrator!! I would LOVE to dehydrate jerky! So far my stevia, french lavender, basil, and thyme would go in. I’d get more serious about the medicinal plants (elder, yarrow, calendula, etc.) that I’m looking for! I growing plantain, lavender, lemon balm, peppermint and sage. I would like to dry all of these and some kale that will come up later. I would love to be able to have some yummy dried fruits during the winter. I would love to add this to my preserving inventory of goodies. There are so many things that can be dehydrated. I would dehydrate my herbs, tomatoes, #2 peaches and apples I get from local orchards. I love dehydrating foods! I would pass on my little 30.$ dehydrator to my daughter who is getting married soon. zucchini… little sea salt and garlic. I would do my herbs this time of year but when the peaches come next year I would do some of those. We had a really good harvest of peaches and blueberries. Yum!! If my name is chosen I would really like to make beef jerky. I won’t buy it for my husband because of all the junk in it, but he loves it, so it would be a great treat. Tomatoes and squash out of my garden! Zucchini!! I’m being over-run by zucchini! But if it was dehydrated, I could use it all winter! I would dry fruit any fruit that is in season. I would finish off my basil and then move on to learning how to do chicken stock – it would save so much space! I would probably make jerky first. Even my 5 year old loves homade jerky. I would make jerky first – family loves it. I love kale chips, but probably would dry whatever I have because the garden fairies have been very generous this summer and my freezer is nearly full. Thank you for offering this give away. I would love to be able to dehydrate some fruits to snack on and any garden treasures I can!! I would start with herbs from my garden and then do some fruits and veggies! Would like to learn how to dehydrate meats to make jerky. I’d like to try making the best jerky ever…and maybe dry some fruit. I would love to win the dehydrator. But in the meantime I need to check out pintrest. Seems everyone does this now. I am so far behind the times. Everything I can get my hands on!! I would probably dry some of the herbs we have growing in our garden, that way I could get the “knack” for this awesome product before venturing into bigger items like tomatoes, red beets, and any & all fruits!! Oh, can not forget jerky for hubby too! Thank you for this great opportunity! I will start with all my home grown herbs! And then anything else I can get my hands on! Next year I will have a garden and start with all I can there! I am just so excited! I would definitely dehydrate some apples and tomatoes! If I would be able to win the dehydrator, I would first have to dry my tears. I have wanted and needed a dehydrator for years but unable to purchase one due to the cost of a good quality one. Then, I would dehydrate anything ripe in the garden. Thank you so much for this opportunity. I would make chicken and beef jerky . We love jerky !!! I want to stew some okra, strain it, dehydrate it, and powder it to use as thickener in cooking! I just learned about it and am dying to try it. Thanks for the opportunity! I would try drying tomatoes, I have a friend that dries even the cherry tomato cut in half, she says they are wonderful! But being that Monday the 18th is my 65 birthday and I’m recovering from a total knee transplant, I’ll end up with my 87 yr old mom and I having BLT’s made with a Cherokee Purple Heirloom tomato that I have been waiting to pick, the second of the year, but have at least 15 more on the vine and babies hiding under the leaves. My old Presto dehydrator bit the dust last year, I’ve been asking for a new one, this is way out of my budget, so I hope I’m lucky!! I would dry tomatoes, pepper , jerky and maybe some apples. I would use it to save my life. I am diabetic and meds aren’t working for me so I decided, after watching several movies like Vegucated, that I would go on a raw food diet in hopes of getting my diabetes under control. I can make yogurt, sprouted grains, toast nuts, make jerky, fruit leather, and so many other wonderful things! I would love to learn how to dehydrate the apples we will be picking from our two trees soon! I would love to dry herbs, pineapple, and apples. I would love to be able to dehydrate the pears from our trees. They are loaded this year. Everything for snacks for my family ! Always wanted to try to dehydrate foods. This would be great for my huge garden to experiment on veg combinations with dried meats and fruits. Keeping my fingers crossed. I would first start dehydrate our herbs and spices. It would be a tremendous blessing to our household to win this dehydrator! It’s an item that we could never afford for ourselves and the harvest season is upon us. I would dehydrate herbs, locally bought fruits and some kale,,, for now. Thank you! what would I start with….. I would start with Whatever is in season! I would start with my most used dehydrated items that I currently buy: Onions, Carrots, Celery, chopped beef. This would save me tons of money each year! Every year I dehydrate half of my garden and can the other half. The Excalibur is the Ritz compared to a motel by comparison. For serious dehydrating, the Excalibur is a my personal favorite. My family says I suffer from OCD…OBSESSIVE COMPULSIVE DEHYDRATING LOLOL…I dehydrate almost everything….somethings I would not waste my time/electricity doing again….but all in all….I try everything…also have a vac sealer but love to store alot of my bounty in 1/2 gallon mason canning jars….they are pretty…I do however, dry about 50 pounds of onions every year….use them alot and give away some…..not alot…of my dehydrated foods…favorites: PEEPS after the holidays when they are cheap…drying them actually changes the “DNA” of the peep….as does marshmallows…mini ones of course…strangest favorite? SPAM…alot of different flavors…cut in thin sticks…grand kids beg for them! I had not considered dehydrating spam, but given the high salt content I imagine it would be rather like jerky.